To get the kids hyped up I mixed up our Class Dojo for the week. Everyday they want to earn 3 points (which should be pretty easy) to move to the next "grade". They seem receptive to it,which is a major plus! Friday Graduation Day! We celebrate my decorating these Class of 2027 badges I have and making Coke Floats for our science lesson. So far this is what I've done. Monday I wore my cap and gown around to tell them that they have to start today thinking about what they'll have to do to get to high school graduation in 10 years and college in 14. 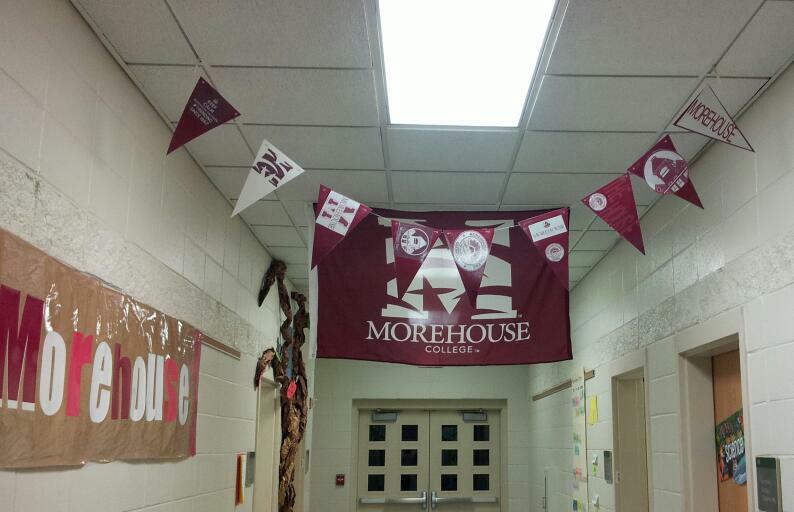 Tuesday I wore my Morehouse apron all day coupled with that gigantic flag I picked up last week. Wednesday I'm rocking the highly anticipated Morehouse bow tie. Thursday I'm pulling out the Morehouse sweater. A true fan favorite. Friday I'm doning the cap and gown to celebrate our kids moving forward in life. I put it out there and I hope some of the other teachers wear their's as well. What else you going to do with it? Pictures will follow. I really wish I could've done more. I've already put in some ideas for next year. We do this again I'm going BIG or going home.